Samples of a marine creature collected during Scott's Antarctic expeditions are yielding data that may prove valuable in projecting climate change. The expeditions in the early 1900s brought back many finds including samples of life from the sea floor. Comparing these samples with modern ones, scientists have now shown that the growth of a bryozoan, a tiny animal, has increased in recent years. They say this means more carbon dioxide is being locked away on the ocean bed. The tiny bryozoan, Cellarinella nutti, looks like a branching twig that has been stuck into the sea floor. It grows during the period in the year when it can feed, drawing plankton from the water with its tentacles. The length of the feeding season is reflected in the size of the annual growth band - just as with tree rings. In the journal Current Biology, researchers from the British Antarctic Survey (BAS) have just published an analysis of growth rates in samples collected in the Ross Sea. This is the Antarctic region where Capt Robert Falcon Scott moored during both the Discovery expedition of 1901-04 and the Terra Nova expedition a decade later, in which he lost his life attempting to return from the South Pole. Other projects have since collected bryozoan samples at the same site, while the Census of Marine Life has increased the flow of data over the past decade. Putting all this data together has allowed researchers to show that the creatures grew roughly the same amount each year until about 1990. Since then, there has been a steady increase, with the annual growth rate now being more than double the 20th Century average. The BAS scientists suggest this means that the bryozoans are now eating for longer, which means they are eating more phytoplankton - the tiny marine plants that draw dissolved CO2 from seawater. "This is important because it's locking away carbon," said lead researcher David Barnes. "The 'branches' of the bryozoans break off and are easily buried, and we've seen that - so burial is taking carbon out of circulation," he told BBC News. The team suggests this is acting to increase the size of the carbon sink - the absorption and storage of CO2 - in the Southern Ocean. However, other researchers have concluded that the Southern Ocean is progressively absorbing less CO2. The Global Carbon Project, an international research network, concluded four years ago that the size of the global sink fell by 18% in the period 2000-06, with a large chunk of that decrease registered in the Southern Ocean. "Winds there have accelerated over the last 50 years, and it's thought this is speeding up the mixing in the Southern Ocean and bringing to the surface deep water that's rich in CO2," said Corinne Le Quere, a member of the Global Carbon Project and director of the Tyndall Centre for Climate Change Research. "So we have observations of this physical process, but the biological activity we don't have much information about; if you're mixing the ocean more, how are organisms responding? "Usually in my experience the biological response compensates a bit, but not enough [to counteract the physical change]; and the fact that you have this one organism with higher growth rates doesn't say how much this is going to affect the carbon balance." If the new research does not shed too much light on the likely progression of climate change, it does help us put the achievements of Captain Scott and his colleagues in a new light. 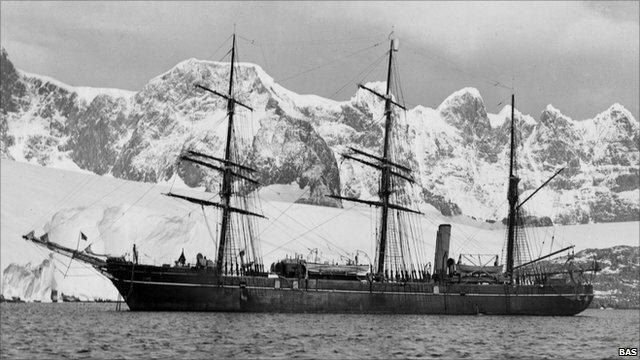 Despite the hardships inherent in polar exploration, both expeditions made the collection of scientific samples a top priority - including retrieving samples from the sea bed at a depth of half a kilometre using trawls. "Prior to this, I tended to associate success in the Antarctic with people like Amundsen and Shackleton - Scott, I thought, doesn't have the same attachment to success," said Dr Barnes. "But now I view things differently, and I think in 100 years' time people will still be using the collections he made - they're extensive and high quality, and in fact we struggled to find collections made after that that were as good. "He really should be given more credit for some of the scientific work they did."